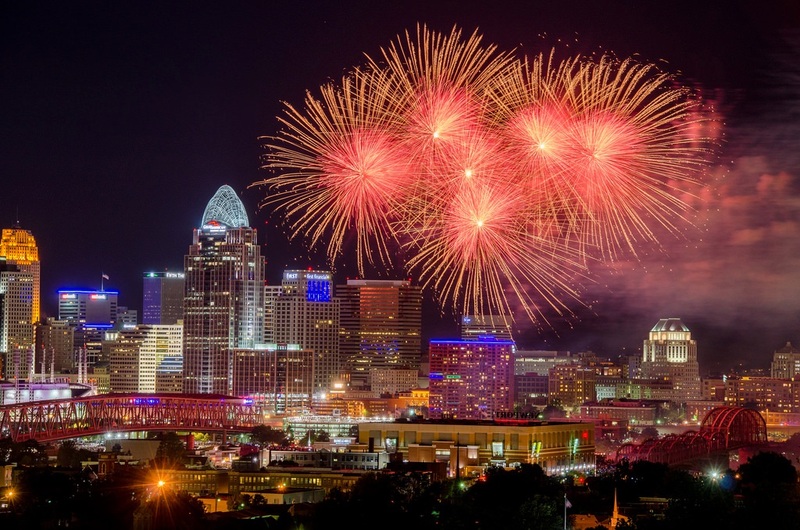 Fourth of July in the Cincinnati region is booming with fun! Here are some places to enjoy fireworks and celebrations during the holiday week. Click here to see a full list of for Independence Day 2018. Firecracker Festival - Enjoy live music, food and beverages, rides, a car show, and a fireworks display at Symmes Township Park in Loveland. West Side Fireworks - Food trucks, games and more will be available leading up to the evening's fireworks show. Light Up Liberty - This family-friendly event at Princeton Pike Church of God features live music and great food, plus carnival activities and a fireworks finale. LaRosa's Balloon Glow – Spend the day at Coney Island enjoying Sunlite pool, live music, family entertainment and classic rides. In the evening, the sky illuminates when hot air balloons of every color glow for all to see from 8-10pm. At 10:00pm, the grand finale is a spectacular Rozzi’s Famous Fireworks display over the banks of Lake Como. Red, White and Kaboom - Festivities are held at Village Green Park, Fairfield Aquatic Center and Rozzi's Famous Fireworks close out the evening from Harbin Park. Ault Park Independence Day Celebration - A full day of family-friendly fun including: Children's Parade, Food, Festivities and Music. The event starts at 11am and concludes after the fireworks at 10pm. Red, White & Blue Ash – Celebrate Independence Day in the northern suburb of Blue Ash with free entertainment starting at 4pm and Arthur Rozzi Pyrotechnics at 10pm. Stricker's Grove 4th of July Fireworks - Spend the day riding rides then enjoy the fireworks display at 10pm. Patriotic Pops – The Cincinnati Pops presents American patriotic favorites at Riverbend Music Center. The fireworks display closes out the evening. New Richmond Freedom Fest - This two-day celebration concludes with a fireworks display along the Ohio River on Wednesday, July 4th. Cincinnati Reds Firworks Show - The Reds take on the Chicago White Sox at 7:10pm, concluding with a post-game fireworks show set to a soundtrack. Florence Freedom Fireworks - The Florence Freedom take on the Washington Wild Things at 6:35pm, concluding with a fireworks display after the game. Fireworks at Kings Island – On July 4th, the 10pm fireworks show will be 10 times the size & scope of the traditional nightly fireworks display. The park stays open until midnight to enjoy even more thrills. Search the Events Calendar to find even more to do during your visit.